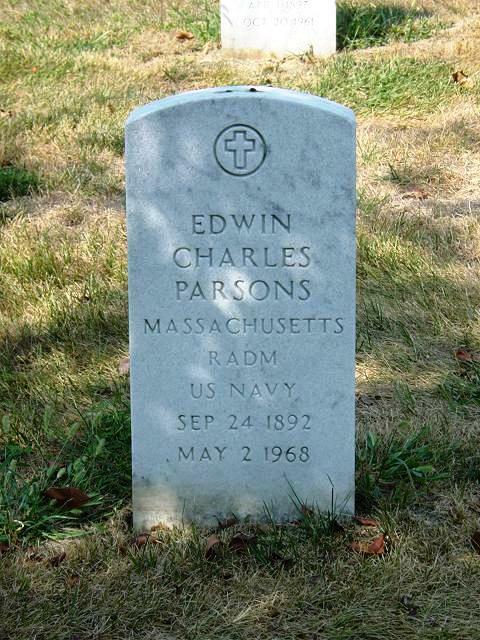 Rear Admiral Edwin C. Parsons, hero of two World Wars, and ace of the famous Lafayette Escadrille, died May 2, 1968 of a lung ailment at Sarasota, Florida, Memorial Hospital. He was 75 years old. Admiral Parsons was born in Holyoke, Massachusetts, September 24, 1892. After graduation from Phillips Exeter Academy in 1910, and attending the University of Pennsylvania, he made his way to California, where he learned to fly at Dominguez Field. This paved the way for a Captain's commission with the Mexican Aviation Corps in 1914, where he trained pilots for Pancho Villa. In 1915, learning of a more interesting war, he worked his passage overseas and joined the volunteer flying unit that became the Lafayette Escadrille. His first plane was a tiny Nieuport with knife-like wings and a nine-cylinder Rhone rotary engine with a Vickers machine gun synchronized to fire between the propeller blades. As a member of the famous French flying unit, he was credited with eight confirmed kills and seven "probables." After the war Parsons joined the Federal Bureau of Investigation (FBI) and served as a special agent from 1920 to 1923. He then went to Hollywood, where he was a script writer and technical adviser on such films as "Wings" and "Dawn Patrol." In 1937 he wrote "The Great Adventure" which was later reissued as "I Flew with the Lafayette Escadrille." He joined the Naval Reserve in 1934 and advanced through the grades to the rank of Rear Admiral. During World War II he served aboard an aircraft carrier and a seaplane tender. He took part in the amphibious landings in the South Pacific, earning the Bronze Star among other decorations. After his retirement in 1954, Admiral Parsons lived on an estate on Little Sarasota Bay in the town of Osprey, Florida. Most of his citations, medals and momentos will be added to the Lafayette Escadrille collections at the Smithsonian Institution in Washington. In 1955 he married Catherine Gardner McKay. In addition to his widow, Admiral Parsons is survived by a daughter of a previous marriage, Mrs. Eliot Brooks of Holyoke, Mass. and a grandson. Funeral services were held at Robart's. Interment was in the National Cemetery in Arlington, Virginia. Past President Paul E. Garber placed an Early Bird wreath on his grave. Posted: 27 June 2007 Updated: 31 October 2009 .